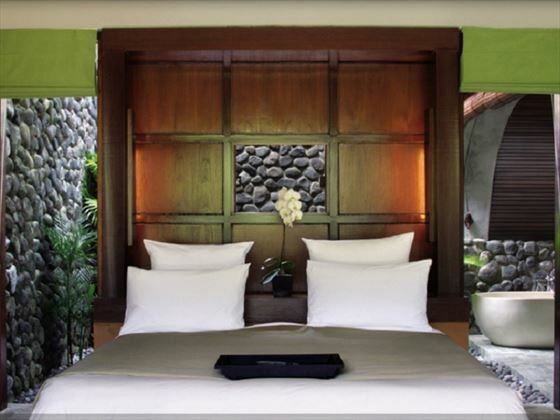 For a tranquil holiday amidst Bali’s beautiful Ayunge River valley, Alila Ubud is perfect. Nestled high up in the jungle-clad hills, Alila Ubud feels like a secluded oasis thanks to its pretty private gardens, intimate ambience, and quiet courtyards. Take a romantic stroll through the valley, taking in views of sweeping rice paddies and verdant mountains, before relaxing further with a rejuvenating yoga class. With complimentary bikes dotted around the resort, and a wonderful infinity pool overlooking the valley, days can be as active or as laidback as you like. The restaurants here really hone in on the ideal of fresh, seasonal and local cuisine. 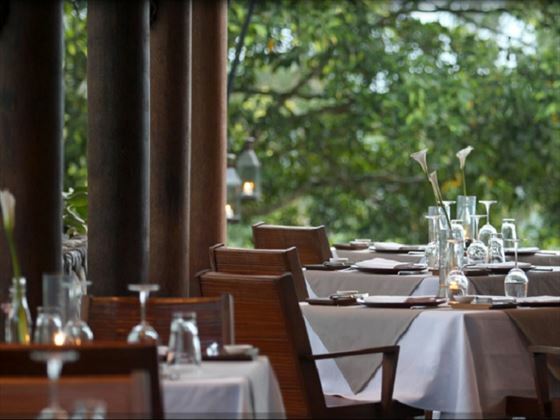 Head to Plantation Restaurant for a taste of Bali’s diverse fare, or nestle into a seat at the Cabana Lounge for a quiet pre-dinner cocktail. 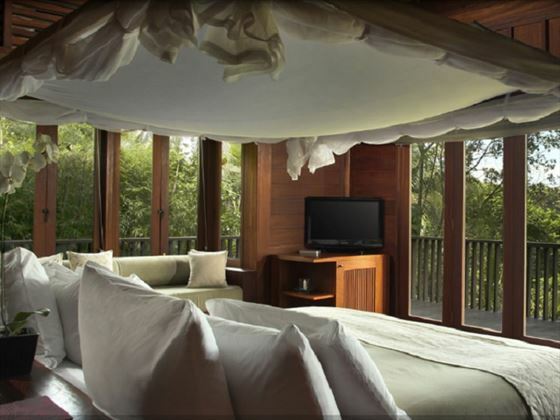 The rooms and villas here are clearly inspired by their natural surroundings, with light and airy décor, and large windows offering panoramic views of the surrounding forest. 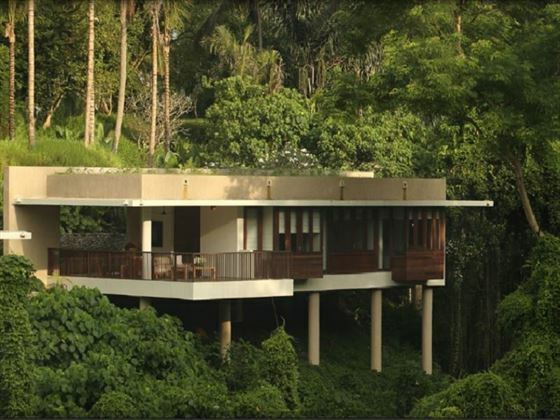 Perched along the edge of Ayunge River valley, Alila Ubud offers the most incredible views and sense of seclusion. 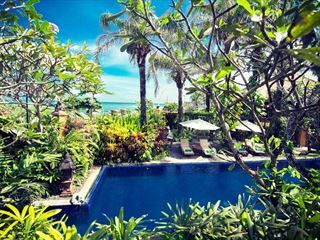 Nestled amongst Bali’s central foothills in the Balinese village of Payangan, you’ll only be 15 minutes away from the bustling Ubud. Deluxe Room – Sophisticated 65sqm rooms located on the ground floor, featuring a garden terrace and courtyard with beautiful valley views. Sleeps a maximum of two adults. 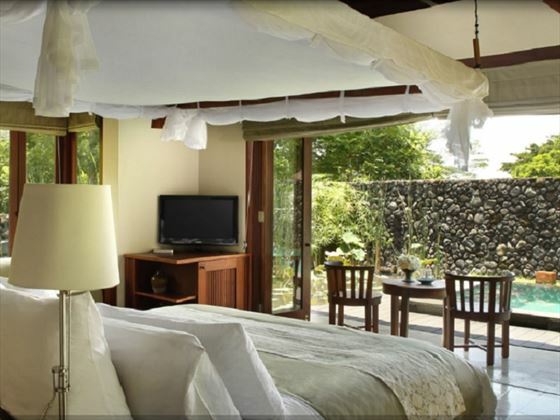 Superior Room – Located on the upper level, these airy 30sqm rooms feature a private balcony with a daybed, with spectacular views of the Ayung River Valley. Sleeps a maximum of two adults. 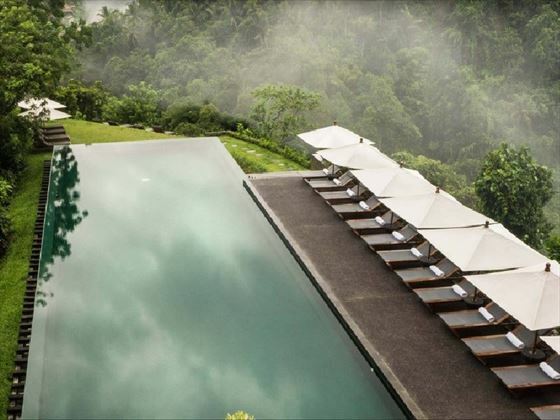 Valley Villa – Perched above the jungle’s verdant canopy, these 75sqm villas offer incredible valley views from its private wraparound deck. Sleeps a maximum of two adults and one child. Pool Villa – Ranging in size, the Pool Villas are secluded and spacious, featuring a private garden with a swimming pool, and a wonderful open air bathroom. Sleeps a maximum of two adults and one child. 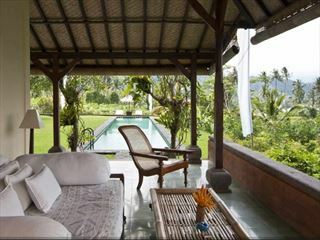 Terrace Tree Villa – Resting on the luscious hillside, these 120sqm villas offer a relaxing ambience and picturesque views of the plantations and rice paddies. Sleeps a maximum of two adults and one child. 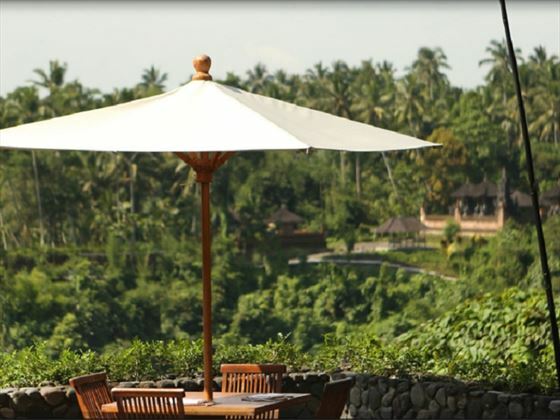 Plantation Restaurant – A gorgeous restaurant serving a blend of authentic Balinese cuisine, and farm-to-table Western tasting menus. 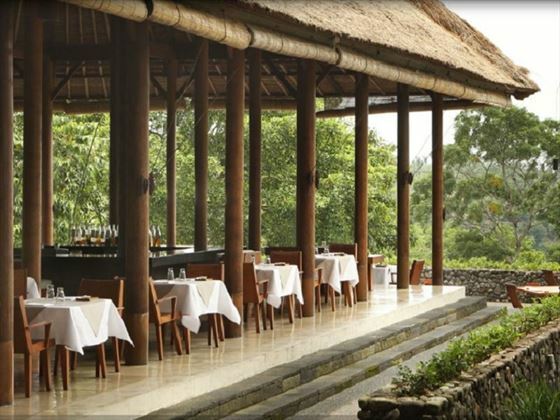 The thatched roof and open-air dining area is breath-taking, and the signature seasonal cocktails are decadent. Open 7am-10.30pm. Cabana Lounge – An intimate space providing a peaceful ambience for daytime relaxation and laidback pre-dinner cocktails. The food here is designed to share. Open 10am-11pm. Sculpture Garden ‘Private Dining Experience’ – Have a romantic evening amongst the garden’s stone pillars, with panoramic views of the rice terraces. 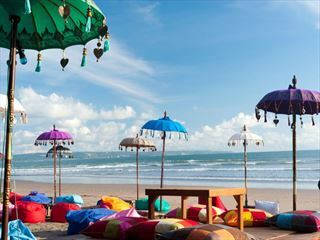 An opportunity to truly immerse yourself in the beauty of traditional Indonesian culture in this unique boutique hotel that celebrates the romance of Bali from a bygone era, from a quiet spot overlooking up-and-coming Canggu beach.